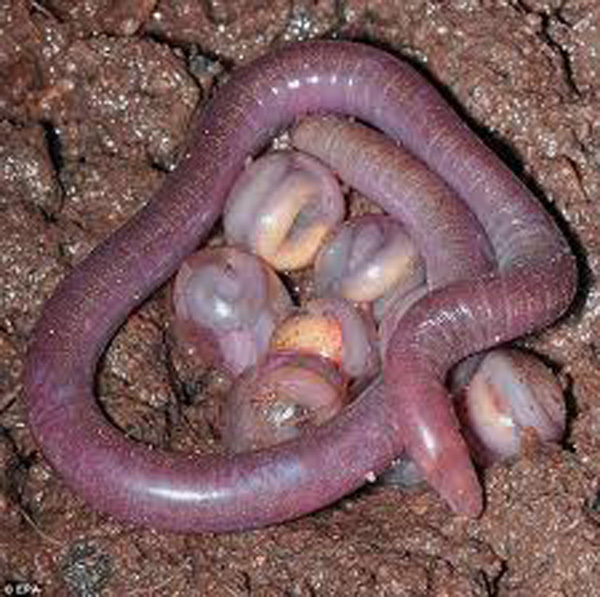 In the deep recesses of the forest in northeast India, three new species of legless amphibians, evolved from the caecilians, spend their lives. This discovery, carried out in collaboration with The Natural History Museum in London, and the University of Delhi, revealed three new species of amphibians, which have now been named Chikilidae. This rare discovery, done by professor SD Buju, an amphibian research professor from the University of Delhi, and his PhD student Rachunliu Kamei, was described as the 'discovery of the year' in February 2012. Buju, who was popularly known as Delhi's frogman, discovered this new family of tailless amphibians, which seem to have evolved from other caecilians more than 140 million years ago. Their findings, which involved the discovery of more than 40 additional new species of amphibians, were published in the international journal ZOOTAXA. The three new species of amphibians discovered, were named as Chikila alcocki, Chikila darlong and Chikila gaiduwani. The results from this study were based on checking several morphological traits and molecular DNA markers, which is by far, the most systematic surveys conducted on caecilians for far, and the first ever in northeast India. ZOOTAXA, which is an International Journal of Zoological Taxonomy, describes the discovery as the 'Discovery of three new blind-legless amphibians from northeast India' and highlights that northeast India may actually be a treasure trove for more unknown species. There may be less than 200 species of caecilians in the world, according to Biju. They came across these tailless species during a fieldwork of soil digging survey carried out between the years 2006 to 2010 in many different parts of India, particularly northeast India, including Manipur, Meghalaya, Assam, Arunachal Pradesh, Darjeeling, Sikkim, Nagaland, Mizoram and Tripura. This study, which has managed to introduce two new members to the Chikilidae family, is unique and one-of-a-kind, mostly due to the fact that this family has only one member- Chikila fulleri, till date, which was a broken museum species, over 100 years old. What's even more surprising is the fact that Rachunliu, who is also popularly known as Chun, has named one of the species as Chikila Gaiduwani after her father- Gaiduwan Gaipuizei Kammai. Given that there are millions of different animal species today, it seems that each of us may get the chance to name a species after ourselves, or someone close to us, in the near future.